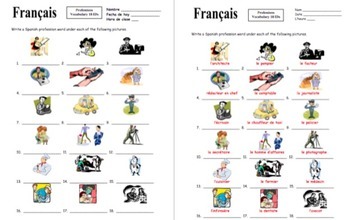 French Professions 18 Vocabulary Image IDs - Students write a French professions vocabulary word under each picture. This can be used for reference and a study guide when complete or students can cut it apart, write the French words on the back of each picture and make flashcards. It can also be projected and used to play the flyswatter game. The answer key is included. This is great for introducing and reviewing vocabulary together in class. Please click here to see more of my French vocabulary materials. 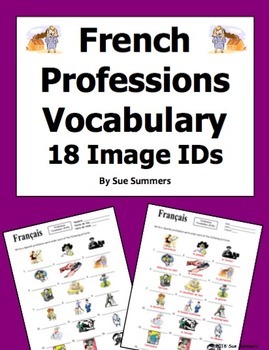 French Professions 18 Vocabulary Image IDs by Sue Summers is licensed under a Creative Commons Attribution-NonCommercial-NoDerivs 3.0 Unported License.